The joint was jumping at Michael’s today with plenty of familiar faces (Kathie Lee Gifford, Henry Schleiff, Fern Mallis) and a few long-time-no-see Michael’s loyalists (Welcome back, Joe Armstrong and David Zinczenko) trading plenty of air-kisses. The power lunch lives! I was really looking forward to today’s lunch with Nan Valentino and Mozell Miley-Bailey for a few reasons. First off, we’re all ‘former People people’ as we alumni of the Time Inc. title refer to ourselves. I first met Nan when she was handling communications for People and worked with her many times over the course of her 12 (!) year career. When she departed Time Inc. in March 2015, Nan had risen through the ranks and was SVP Corporate Communications and Brand Development for news, sports, entertainment and fashion. What I didn’t know was prior to her stellar career at People, Nan had an equally accomplished 12-year run at Christie’s where she founded the house’s ‘Popular Arts’ department and specialized in all things celebrity. She was responsible for the blockbuster Marilyn Monroe auction and managed Princess Diana’s headline-making ‘Dresses’ sale. “It was an exciting time because suddenly it became socially acceptable for celebrities to sell their things,” said Nan. And how. Since January of this year, Nan has returned to the auction world as COO of Julien's Auctions, the record breaking house which handled the sales of Marilyn Monroe's happy birthday Mr. President dress ($4.8 million dollars!) and Michael Jackson's white glove, both of which garnered them two Guinness Book of World Records. And for “Gone With the Wind” fans, Vivien Leigh's Scarlett O'Hara necklaces and Clark Gable's Rhett Butler cigar case from "Gone with the Wind” are up for sale. The book, which must weigh five pounds, is as grand as the icons it celebrates and juxtaposes the jewelry with photos of the stars and movie stills. It’s worthy of the chicest coffee tables (that where I’m putting mine). And here’s a fun fact: many of the pieces Joseff created were worn by multiple stars. The same gold-plated tiara Bette Davis wore to play Elizabeth I was worn six years later by Ginger Rogers in a studio publicity photo. In this Rent the Runway era, it turns out Joseff was way ahead of his time. 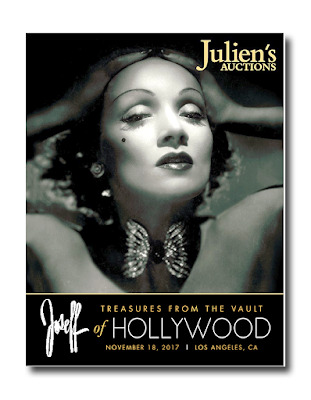 On November 17, “Icons & Idols: Hollywood and More” will feature a more eclectic array of showbiz and celebrity relics including the largest collection of Judy Garland's costumes, a Nobel Prize medal, Marilyn Monroe's screenplay for Breakfast at Tiffany's (she was Truman Capote’s first choice for the role!) JFK's commissioned rocking chair, Evel Knieval's motorcycle and jackets, Neil Armstrong's space glove and, wait for it -- the wedding cake souvenir from Donald Trump's wedding to Melania. Jane Pauley (who we love on CBS Sunday Morning) with husband cartoonist Gary Trudeau with two folks we didn’t recognize on Table One … Peter Brown at his usual spot on Two … I was thrilled to see ‘Mayor’ Joe Armstrong back in town (he decamped to Plano, Texas a while back after 27 years in the big city) with his good pal David Zinczenko who, in addition to running his own hotter than hot media company, Galvanized, is back at the Today show giving expert advice on health and fitness after a nice run on Good Morning America. Moving on … Leonard Lauder at Table Four … Kathie Lee Gifford, looking fabulous, and Eva Mohr were enjoying some of KLG’s own chardonnay and then Kathie sent some over to Joe and Dave’s table. How thoughtful … The ‘Imber Gang’: Dr. Gerald Imber, Jerry Della Femina, Andy Bergman and Michael Kramer enjoying the weekly ‘boys’ lunch’ on Six …New York Social Diary’s David Patrick Columbia at his usual perch with Paul McDonnell and his father, Ed, on Table Eight. The McDonnell’s are the former owners of Seagrams. Just thought you’d like to know. And there’s more … Jack Myers with some media folks on Twelve ...Jimmy Buffet (yes, that Jimmy Buffet) on Fourteen … Steven Haft, who arrived with his own coffee from Starbucks …Barry Frey on Seventeen … Henry Schleiff on Eighteen … On Table Twenty: Fashionista Fern Mallis, who will be interviewing designer Eileen Fisher at the 92nd Street Y on December 5, with former Page Six-er Paula Froelich, who has been writing some editorials for The New York Post and is as busy as ever with her "A Broad Abroad", her award-winning travel and lifestyle site. See you next Wednesday!